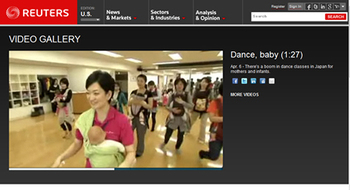 The Baby Dance was born in Japan in 2007. The founder of the IBD is Yumiko Tanaka, a professional Latin dancer, who suspended her carrier during her maternity leave. She had danced to win competitions as a professional dancer. Her parents were divorced during her childhood, and her mother passed away just after the divorce. Therefore her elder sister raised her as a guardian. She won dance competitions a lot, not only with her hard training but also with such a feeling that she would be superior to those who raised with her two parents without any family problems. However, she came to realize that she would never be fulfilled, even though she kept on winning the competitions. After she delivered her first baby, she spent her life without dancesport. One day, when she made a small dance with her baby holding in her hands, she suddenly noticed ineffable happiness. It was a dance for joy, a dance to feel the tie between her partner and herself, and a dance which is far from competition. She thought that she was fulfilled for the first time. The days with her small baby in a small space had changed to a better way by dancing with her baby. More and more friends who brought up their babies got together for the dance. She felt the tie between her baby much tighter than before, watching baby’s face satisfied being with her mother by the Baby Dance. Baby’s night-time crying or whimpering went somewhere. She came to think that childcare is fun! Because the Baby Dance became popular and she could not handle the Baby Dance lessons only by herself, she decided to train instructors for the Baby Dance. In 2009, she founded the Japan Baby Dance Association (JBD) In March 2009, the Reuters and the Japan Times covered her activity, which resulted in an opera-singer-instructor in the U. K.. The International Baby Dance Association (IBD) started. Nowadays, the Baby Dance has been spreading to the U.S.A. and Hong-Kong, and other places in the world. “Mother dances with her baby in her hands”; although it sounds so simple, the Baby Dance is highly programmed under the supervision by psychologists and pediatricians. It is also completely different from a social dance for wider ranges of ages. The safety of babies is highly secured by doctors, and courses are opened at obstetrics and gynecology hospitals and general clinics. Our starting point is “happiness with dance with baby”. Whether you dance well or not does not matter. Although the name has the word “dance”, the meaning of this word is a realization of expression of you. The more important factor for instructors is communication skills, rather than the dancing techniques. Instructors are willing to wish other person’s happiness. Then the dancing skills also improve. The purpose of the Baby Dance is not to create a new trend, nor to form the best dance team. It is to educate persons who can understand the feeling to be “as it is”, and express the feeling, and connect mothers. We are suffered from the flood of information via the internet in the recent society. So, why don’t you start dancing with smile? The Baby Dance is a bridge between mother and child, couple, family, and the world. The Baby Dance connects the world. Let’s enjoy the Baby Dance together!